It wasn’t only a crew of eccentric English mathematicians with brains the size of basketballs who cracked the Germans’ Enigma code during WWII, but a whole cast of spies and soldiers as well, says journalist Sebag-Montefiore in this magnetic story of breaking the cipher. Not that Sebag-Montefiore downplays the inspired contributions of those famed cryptographers at Bletchley Park (including Alan Turing, the eccentric genius who used to pedal his bike about the countryside wearing a gas mask and kept his coffee mug chained to a radiator). The author spends plenty of time detailing their toils, complete with code-smashing math in appendices. But other players were involved, as well as the workings of fate and dumb luck. 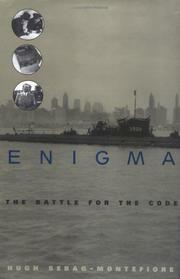 There was also more than one Enigma code, and each was more vexing than the last. There were spies who sold early versions of the code to the French, whole companies of men assigned to raiding German vessels (particularly U-boats) for Enigma machines, and an important cast of Polish codebreakers and intelligence officers. Sebag-Montefiore does a masterful job of keeping the suspense ticking as he fills in all the details, for as he makes clear, it was not just breaking the code that was critical, it was keeping that knowledge a secret so as to exploit the information. What made it all so cat-and-mouse—and what keeps the reader on the edge of the seat—was that the Germans were suspicious that Enigma had been compromised (but never enough so to stop using it), Gestapo agents in occupied France were arresting individuals who knew the extent of Allied progress on Enigma, and the Allies themselves didn’t know what had been divulged. The fate of the invasion at Normandy hung in the balance.